What would it look like if you were one of the healthiest family-owned companies in the country? Research shows that a strategically developed employee wellness program not only lowers health care costs, but it increases productivity and improves employee retention. 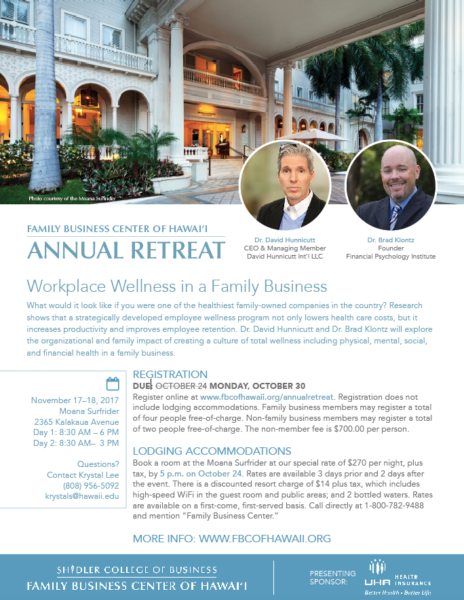 Dr. David Hunnicutt, Dr. Brad Klontz, and Dr. Ted Klontz will explore the organizational and family impact of creating a culture of total wellness including physical, mental, social, and financial health in a family business. Registration will close on Tuesday, October 24 Monday, October 30. Registration does not include lodging accommodations. Family business members may register a total of four people free-of-charge. Non-family business members may register a total of two people free-of-charge. The non-member fee is $700.00 per person. While many inherently buy-in to the idea of staying healthy and well, few people understand precisely why or how wellness works. 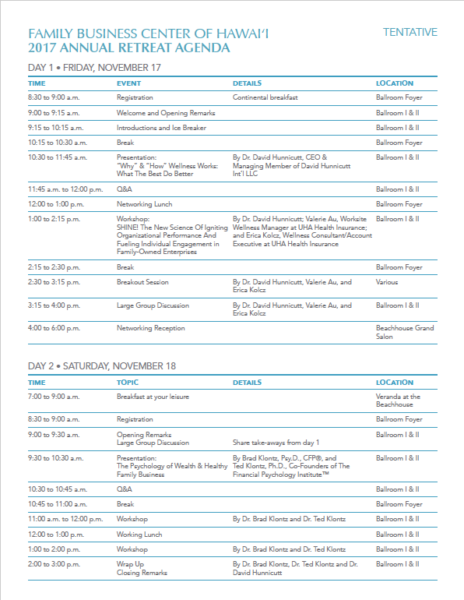 In this opening session, Dr. David Hunnicutt will immerse participants in the fascinating science behind what’s referred to as “The Theory of The Compression of Morbidity.” Put forth by some of the nation’s leading scientists, this framework is the key to understanding “why” and “how” wellness works. As a result of better understanding this theory and framework, participants will have in their possession the knowledge of why and how wellness works—the key that unlocks the door of personal and organizational health improvement—especially in the context of family-owned business environments. Having laid the foundation, David will then outline the key factors necessary for participants to get and stay healthy by choice—not by chance. Zeroing in on the intriguing research behind building healthy habits, David will share the evidence-based secrets behind making the healthy choice the easy choice. At the completion of this session, participants will understand why some personal improvements work and others get derailed—and exactly what to do to make wellness work in their own lives. Thousands of new wellness and family business books are released each year. Tens of thousands of research articles are written. Yet, perhaps the most important family business, worksite wellness and performance improvement practices–the ones that virtually guarantee engagement and ignite performance–are rarely, if ever, mentioned. In this hands-on, highly-interactive and engaging afternoon session, David Hunnicutt and his co-facilitators Valerie Au and Erica Kolcz will zero in on the most overlooked and neglected worksite wellness practices that guarantee engagement, improve health and ignite performance. All especially important in a family owned enterprise. Building on the material presented in the morning keynote, the facilitators will lead you through a roll-up-your-sleeves, practical experience which will help everyone in attendance better understand the art and science of creating an organizational wellness initiative designed for family-owned enterprises that brings out the best in all of your people, family members and non-family members too. The stereotypes of the wealthy and where they go wrong. Three psychological constructs that explain why we tend to hate rich people. Psychological factors linked to high income and net worth. Money beliefs linked to lower income, lower net worth, and self-destructive behaviors. Why we are wired to self-destruct around money. How financial help can hurt and what we can do about it. Why people resist our best advice and how to break-through. Using Neuroscience to build robust family business relationships? Give effective feedback and advice. The FBCH is pleased to welcome UHA Health Insurance as the presenting sponsor of the 2017 Annual Retreat. As the only health plan in Hawai‘i founded by physicians, it was the first to offer preventive and wellness care focused health plans in the state, and now offers innovative workplace wellness solutions. UHA’s sponsorship will help fund the Family Business Center of Hawaii Distinguished Professorship.